We are just one week away from Christmas you guys! Can you believe it? I've been prepping for the Holidays and shopping for presents has been so overwhelming! I've been super busy the past two weeks that I haven't had much time to cook. We all need to make time for family and cooking can be so time consuming during the Holidays! Today, Savannah and I went to Safeway to grab some groceries and we ended up getting our favorite Red Baron pizza for dinner. Frozen pizza is such a lifesaver especially on Mondays when I haven't had time to prepare a homemade meal. 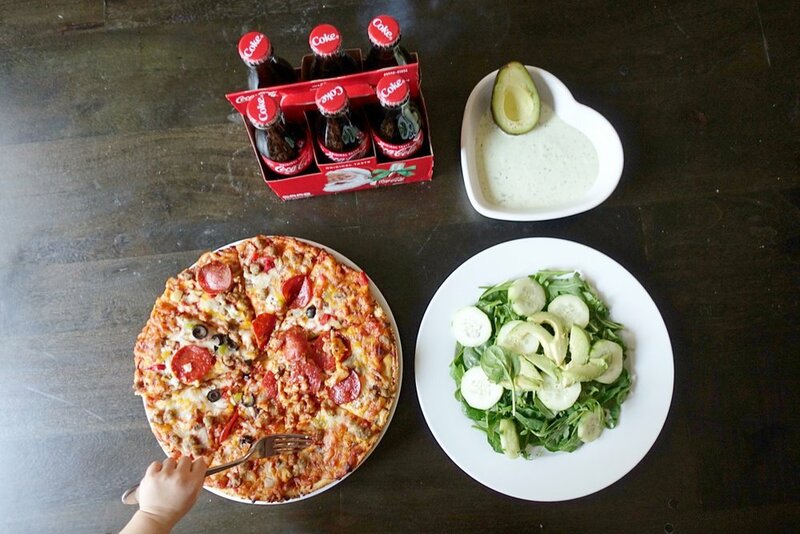 I love pairing my pizza with a healthy side salad and a nice cold Coca-Cola™. nofollow. Now until December 31st, head to your local Safeway, Albertsons, or Vons to get $5 towards a movie ticket with a $10 purchase of participating products in one transaction. You'll receive a code on the Catalina receipt and will be directed to the Fandango site to redeem the movie ticket reward. Be sure to look out for the signs in store for the offer! Savannah found them pretty quickly! Hope you mamas will get to sit down and relax this Holiday season!